By MATT NEWTON | The twin waters of Port Davey and Bathurst Harbour in Tasmania’s remote South West are together an expanse of water and endless inlets twice the size of Sydney Harbour. They are in the southwestern corner of over one million acres of wilderness. It is a truly spectacular place, with epic scenery and a feeling of isolation that is hard to match. 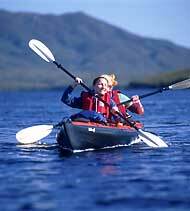 Walking on water is the way sea kayaking trips to Bathurst Harbour are described. Like bush walking without having to carry anything and, best of all, no hills. A sea kayaking trip to Tasmania’s South West starts with a 45-minute light aircraft flight from Hobart. Once leaving the airport, Tasmania’s capital city quickly gives way to large tracks of forest and some of the most rugged alpine scenery in Australia. The Western Arthur ranges and the spire of Federation Peak pierce the clouds as the small plane tracks a course to the tiny runway at Melaleuca on the southern end of Bathurst Harbour. It is no exaggeration to say that Melaleuca is in the middle of nowhere. 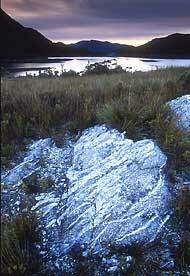 There are much vaster tracts of land on mainland Australia, but few would match the ruggedness of Tasmania’s southwest. After the plane bounces to a halt on the gravel runway all you need for the next week is unloaded and the adventure really begins. The departing drown of the plane and the following silence gives a great sense of isolation —and freedom. Once all the necessary gear is packed into waterproof bags and loaded into the kayaks. The guides, Kim Brodlieb and Ian Balmer, who pioneered sea kayaking trips in the area, give a short rundown on a few safety issues and kayaking technique, nothing too technical, just a few tips to get you on your way. From Melaleuca the meandering river winds its way towards the harbour. The water is the deep colour of tea, stained this colour by the vast plains of button grass. The dark water is like a mirror and it is often hard to tell where the real world ends and reflections begin. Towards the river’s mouth Mt Rugby comes into view, its slopes of rising from the water and wasting no time in reaching the summit at 700m. It is a handsome conical mountain and those that have made the climb to the summit say the view is to die for. 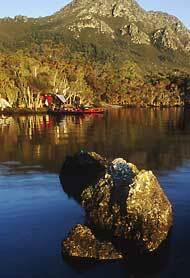 The campsites on the shores of Bathurst Harbour are nestled in sheltered nooks in groves of open rainforest. They need to be, as in this part of the world the weather can change at any time and a sheltered campsite can make the difference between having an exciting experience witnessing the power of nature in comfort or not. The weather and the sheer size of this place are the two prime reasons it is wise to take a guided trip to this area. Local knowledge is worth its weight in gold here and a distinct advantage. 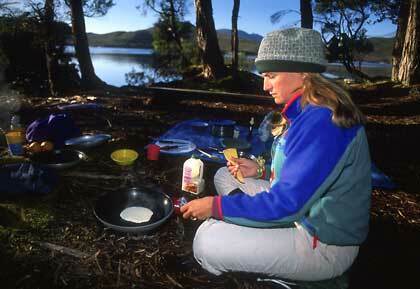 The meals that Kim and Ian produce in the wilderness are almost as stunning as the scenery and lend even further weight to the argument for having a guide. Cinnamon scrolls, fresh baked cakes and pizzas are all part of the fare. Not what you would expect to materialise from the inside of a sea kayak. Once out on the harbour, each day’s itinerary is influenced by aspects of the weather such as wind and tides. The group decides how arduous each day should be. Generally the paddling is quite easy, with plenty of stops to enjoy the view and refuel on a variety of goodies stowed in the kayaks. Camp is usually struck early in the afternoon to allow people to explore the shoreline and take time to themselves to experience the grandeur of the place. Ian has an encyclopedic knowledge of southwest Tasmania, which helps to bring the area alive and add to the quality of the experience.